A 9 carat gold sapphire and diamond oval cluster ring, and an 18 carat gold tourmaline ring with diamond set shoulders. An 18 carat gold ruby crossover ring, with channel ruby and diamond shoulders, and a 9 carat gold three stone diamond ring. 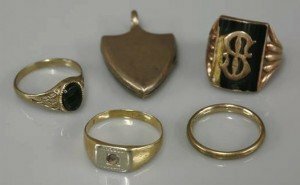 A gold initial ring, marked 9 carat, a 9 carat gold onyx signet ring, a two colour ring, stone deficient, tested as approximately 18 carat gold, a rolled gold band ring, and a back and front locket. An 18 carat white gold three stone diamond ring, and a 9 carat gold sapphire and diamond half wishbone channel set ring. 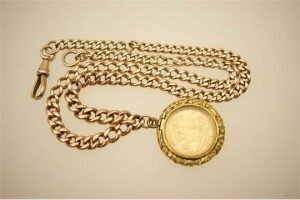 A 9 carat gold graduated curb link watch chain, supporting a gold picture locket with an Edwardian half sovereign, the chain 41.5cm, gross weight approx. 34.1g. 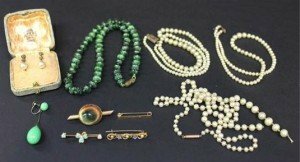 A gold, opal and diamond set bar brooch with a trefoil motif, a gold and operculum brooch, a gold and seed pearl and enamelled brooch with forget-me-not motifs, a gold lace pin, a pair of imitation pearl earrings, three imitation pearl necklaces, a green costume necklace and one earring. 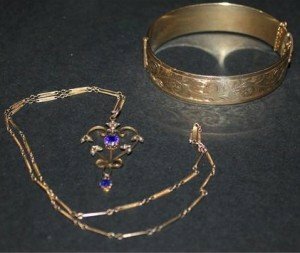 A gold, seed pearl and blue gem set pendant with a gold neckchain, and a gilt metal oval hinged bangle with scroll engraved decoration, detailed ‘9ct gold metal core’, on a snap clasp. 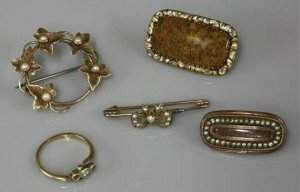 An ivy and split pearl wreath brooch, tested as approximately 15ct gold, a split pearl gold bow bar brooch, a Georgian memorial brooch, a gold cased jasper brooch, and a three stone diamond ring, two stones deficient, marked 18ct. 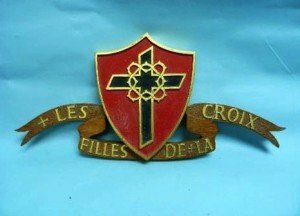 Les Filles de la Croix: a carved wooden plaque of the Les Filled de la Croix crest, formed of a crucifix set within a central shield painted in red and black, highlighted in gold. 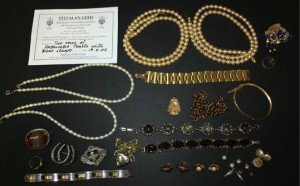 A group of mostly costume jewellery and some silver items, including a curved panel shaped link bracelet, an oval cornelian brooch, two Victorian brooches, a heart shaped pendant locket with a gilt metal chain and a garnet set three stone ring. 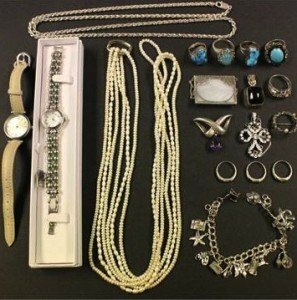 A group of mostly silver jewellery, comprising a ropetwist link neckchain, a rectangular glass panel shaped pendant necklace, a brooch, a charm bracelet, a pendant with a neckchain, two further pendants and eight rings, including two turquoise matrix set rings, detailed ‘Joe Chee’, together with two ladies’ wristwatches and a six row necklace of freshwater cultured pearls. 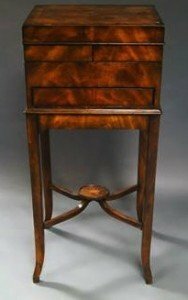 A Victorian style mahogany ‘Althorp’ jewellery box on stand by Theodore Alexander, late 20th century, of rectangular form, the hinged cover opening to reveal swing out sections, the box with side drawer, fitted interior and single front frieze drawer bearing metal maker’s crest inside, the whole raised upon shaped legs with conjoining stretcher bearing crown. 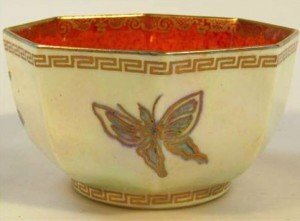 A mid-20th century Wedgwood butterfly lustre bowl, the octagonal body decorated with butterflies with an upper Greek key banding, the interior with orange sponging and various gilt highlights on a circular foot, printed marks beneath. 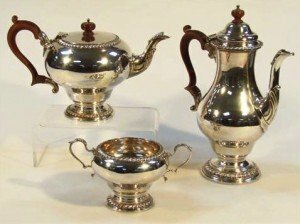 An Elizabeth II silver three piece tea and coffee service, by William Comyns, comprising coffee pot of Queen Anne shape with domed lid, baluster body and part shell spout, with polished wooden knop and handle on a circular foot. 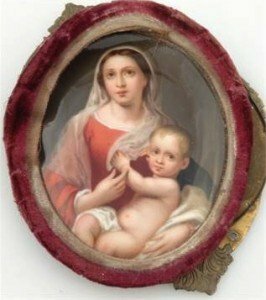 A late 19th century porcelain plaque, of The Virgin and Child, polychrome decorated in an oval outline, part mounted and framed, possibly Berlin. 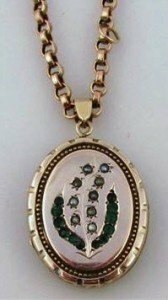 A belcher chain, with heavy links, yellow metal, 100cm long, tested 9ct rose gold, attached to an oval pendant locket, florally set with small pearls and green stone, 40g all in. 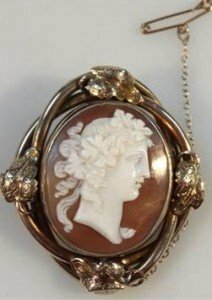 An early 20th century Italian shell cameo, formed as a lady side profile, in an entwined setting set with leaves with a plain chain and pin end, marked 9 carat. 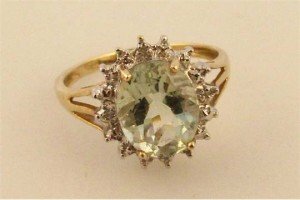 A ladies claw set dress ring, set with a green stone surrounded by small diamonds on a floral arrangement, on a part pierced yellow metal shank. 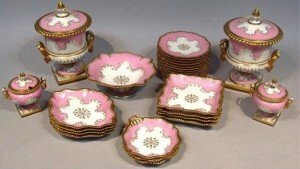 A Magnificent early 19th century part dinner service, comprising two ice pails, each of campana form with an upper gardooned outline surmounted by fruit finals, decorated in pink with gilt highlights, each terminating in square gilt scroll bases, 37cm high, two sauce tureens, twelve shaped plates, four square shaped serving dishes, open comport, three open sauce dishes and four further open dishes similarly decorated, impressed marks beneath. An 18th century Lowestoft porcelain cream jug, the helmet shaped body hand painted with roses and other summer flowers predominately in pink, green and purple, with an ear shaped handle and plain spout on circular foot, and two others similar.